I'm in the second row, the fourth from the right. I ordained the Rev. 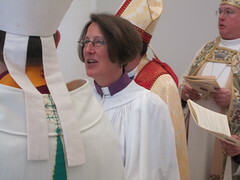 Bonnie Morris to the priesthood last Saturday at Calvary Church in Williamsville. Ordinations are always joyful, but this one was particularly so for me since it was the first ordination I have performed since becoming a bishop. Later in the day I visited the Cursillo retreat, another joyful event. On Sunday, I made a visitation to Ascension Church in Buffalo, where I confirmed one person and then went on to St. Paul’s Cathedral where we wished a happy retirement to Deacon Bruce Gillies and welcomed the Venerable Jerry Hilfiker as our new archdeacon. 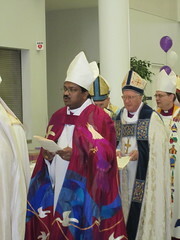 This week I am attending the College of Bishops being held at Lake Logan Episcopal Center in North Carolina. 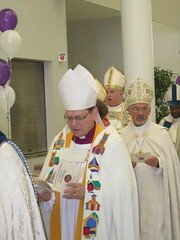 This entry was posted in Anglican Covenant, Current Issues. Bookmark the permalink. LOVE Lake Logan. Was there just about a year ago for CREDO. We had a nightly visit from the mockingbird and, one evening, some bears. Enjoy! You remain in our prayers. Thank you for the video and thank you for speaking clearly for the historic understanding of who we are as Anglicans.